Welcome to the beautiful shores of Lake Superior--the largest of the Great Lakes, and the largest freshwater lake in the world. Lake Superior and the rest of the Great Lakes settled at their current water levels 7,500 years ago. Along these rugged shores are ancient rocks formed by magma from the melting of the earth's mantle millions of years ago. Glaciers ground down the bedrock and broke off chunks carrying the pieces to our area of the Great Lakes from the North. and Rhyolite: which is rust in color and composed of many minerals. View a selection of our lamps. 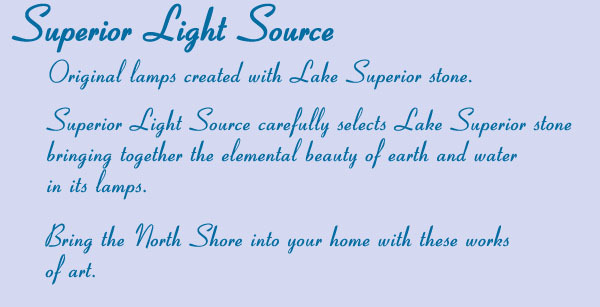 Lamps are created with multi-colored stones to fit in with any decor. The companion shades come in a light dusty green-grey to compliment the color of the natural stone. All lamps are wired with UL-approved materials. Custom orders are available, please contact me to discuss your custom needs. I hope you enjoy your lamp and piece of geological history! Copyright 2004, Superior Light Source. All rights reserved.